No longer a hobby just for geeks holed up in basements, video games are everywhere. From public parks swarming with families hunting for Pokémon to enthusiasts who live on the bleeding edge of PC hardware, millions of people play games every day. A select few of those individuals are so inspired by their favorite games that they make the jump from player to creator, becoming architects of experiences that leave indelible marks on our lives and culture. These are their stories. 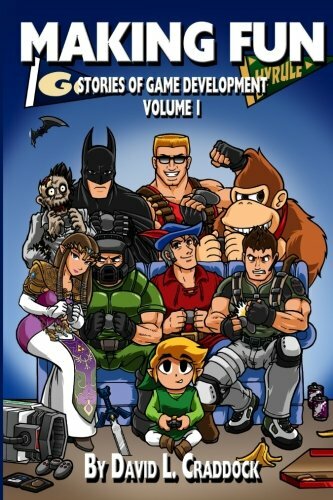 Weaving together extensive research and interviews, Making Fun: Stories of Game Development – Volume 1 chronicles narrative-style accounts about the making of video games and the people who make them — their goals, their struggles, and their triumphs. Read about the making of: · FTL: Faster Than Light · Resident Evil · Rebel Galaxy · Donkey Kong Country · Spaceteam · The Legend of Zelda Series · The Gabriel Knight Trilogy of Point-and-Click Adventures · And more!